Upon arrival at the Noibai International Airport in Hanoi, meet and greet the driver at the arriving hall. Transfer to the city centre by a private car and check-in at the Hanoi Amanda Hotel (early check-in is subject to availability). Enjoy your free time at the rest of your day. AM: We pick you up from your hotel at 8:15am. 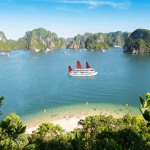 (we may do several picks up) for a 3.5 hour drive North East of Hanoi taking you across the Red River delta, the second biggest in Vietnam and through the scenic country side to reach Halong Bay. As the sun sets over the bay, we head back to our cruise and relax. Coffee, tea and fruits will be available on the sundeck or you can order your favorite drink from the bar. 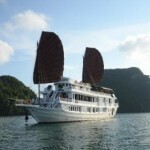 The Halong Phoenix Cruiser continues to sail to a private, quiet anchorage area for the evening. 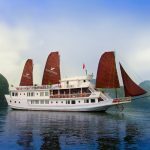 Return to the Halong Phoenix cruiser to begin your return journey to the harbor and experience viewing other areas and islands of Halong Bay. 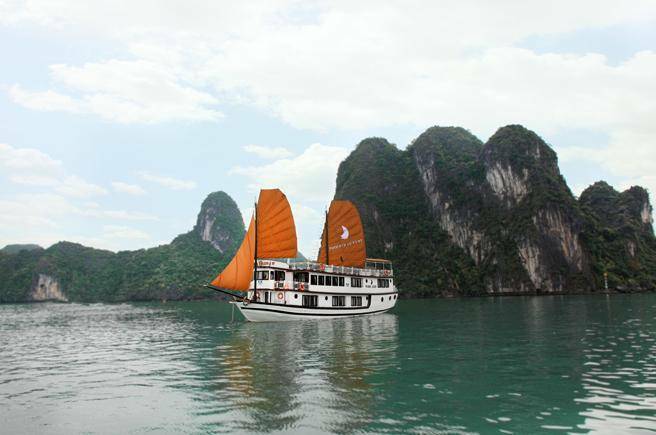 12:00AM: Depart the Halong Phoenix cruiser and travel by tender boat back to the marina where you then board the bus for your return journey to Hanoi arriving at your hotel at approximately 16:30. Check-in at the Hanoi Amanda Hotel. Free time in the afternoon. 06.30 – 07.00. Pick-up at hotel in Hanoi Old Quarter, meet and greet the driver / tour guide at the hotel lobby for the travel to Sapa. 07.00. 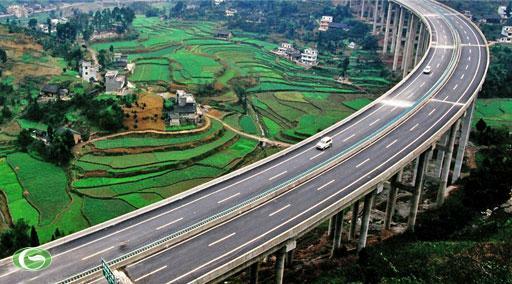 Start the scenic drive to Sapa via Noi Bai – Lao Cai highway. Enjoy the landscape of the Red River Delta country side and have comfort short breaks on the way. 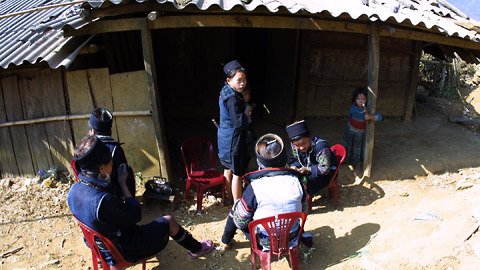 12.00 – 12.30: Arrive Sapa town with colorful traditional costumes of H’mong, Dzao, Tay ethnic People. Enjoy the welcome drink and itinerary briefing at the local restaurant. 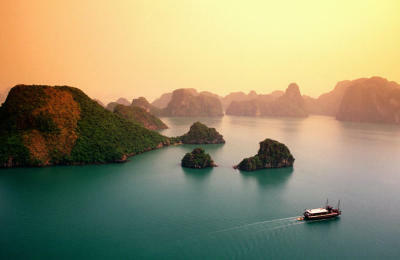 Have lunch with local Vietnamese dishes, then check-in procedures (early check-in subject to availability). After that, you may have some times to rest at the hotel & prepare for the trekking in this afternoon. 14.00. 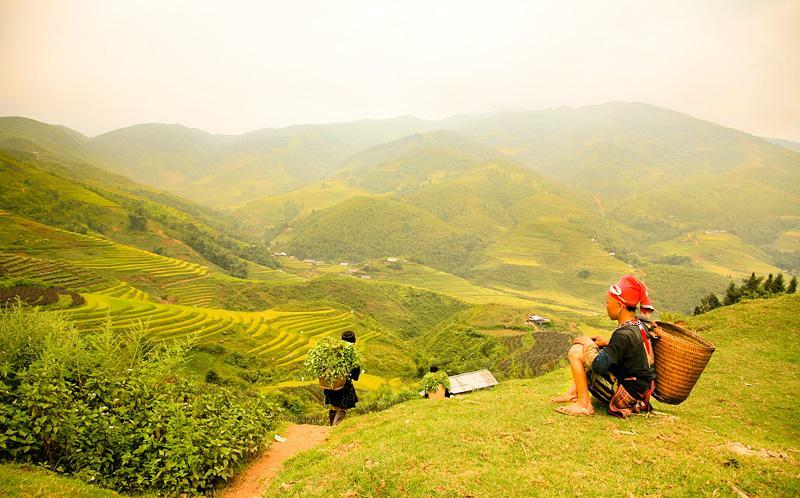 Get a short drive to Y Linh Ho village and start trekking to the beautiful Muong Hoa valley. This is the large area where the Black H’mong & Dzay people live for thousand years. 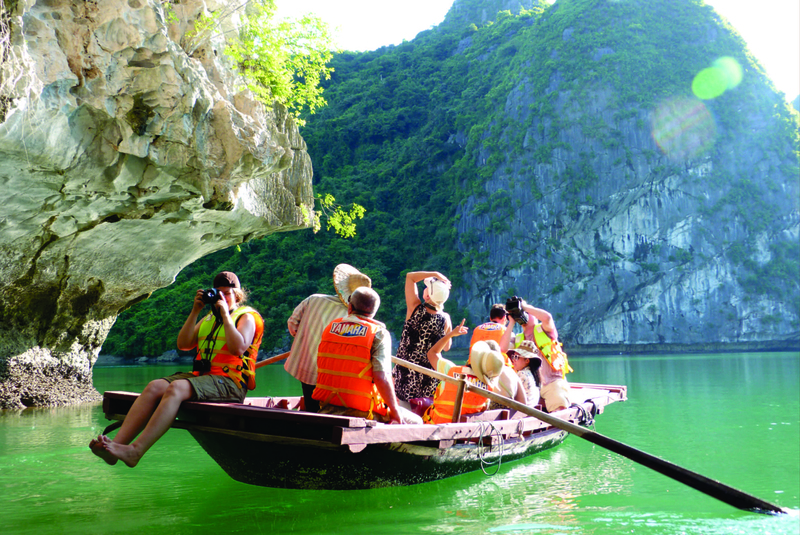 Enjoy the spectacular landscape of Hoang Lien Son Mountain with a visit to Lao Chai & Ta Van village. 17.00. Meet the bus at Ta Van bridge to travel back to Sapa Town. Our tour guide will recommend you good local restaurants for your dinner on your own, overnight in the Four Seasons Hotel with night activities. You can enjoy the night market with many specialities of the highland, watch people playing their traditional flutes. 07.00 – 07.30. Enjoy breakfast at the hotel and prepare for the trekking today. 08.15. Trekking to Cat Cat village of the Black H’Mong people. Don’t forget photo shooting at the French built Hydraulic Power Station; stop for photo with bridge and waterfall. Enjoy the traditional dance with flute & other musical instruments performed by local people. The walk commences from the central square on a trail running through the beautiful gardens and lush pine forests. 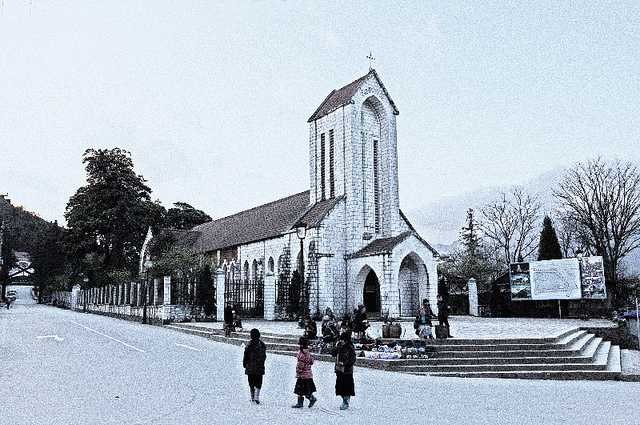 You will then pass through some ethnic minority villages of Sin Chai, a very small village hiding way from the civilization. The trek continues through rice paddy fields and spectacular scenery. During the day you will also be able to visit a local school. 10h00: Meet the bus to be transfer from Cat Cat to Sin Chai village (1.5km). You can already recognize them by dressing while they are both very famous of handicraft. You will enjoy walking among local people. The trip also offers you the opportunity to visit a local house. Watch how they make the embroidery and dry those special products here. 11.00 – 11.15. Bus pick up from Sin Chai village to come back to Sapa town. 11.15 – 14.00. Shower & do the check out at the hotel before having lunch at a local restaurant. You will have some times at leisure on your own or visit the Frech built architects in 1926 Holy Rosary Stone Church and Centre Square. Don’t forget buying some souvernirs for your friends with special products of traditional handicrafts. 14.00. Meet all group members at hotel to get ready for Hanoi andget on bus to go back to Hanoi with some comfort breaks via highway Lao Cai – Noi Bai. There is no planned activity today. You have free time to strolling around the city and buying souvernir for your friends until the appointed time with the driver for the private transfer to the airport. Enjoy your onward flight. Thanks for travelling with Asialink Travel. End of services! Upon arrival at the Noibai International Airport in Hanoi, meet and greet the driver at the arriving hall. Transfer to the city centre by a private car and check-in at the Golden Silk Boutique Hotel (early check-in is subject to availability). Enjoy your free time at the rest of your day. 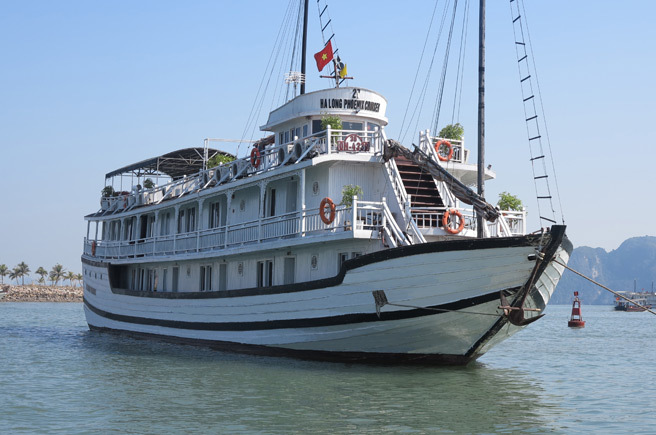 PM: As you settle into your cabin, our boat sets sail to the centre of this World Heritage site. Lunch is served in the restaurant while you enjoy the amazing scenery and delicious lunch of fresh local seafood or your requested vegetarian meal. 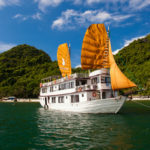 Cruise amongst the hundreds of islands and gorgeous natural settings, limestone bedrocks and sheer cliffs of tiny islets. 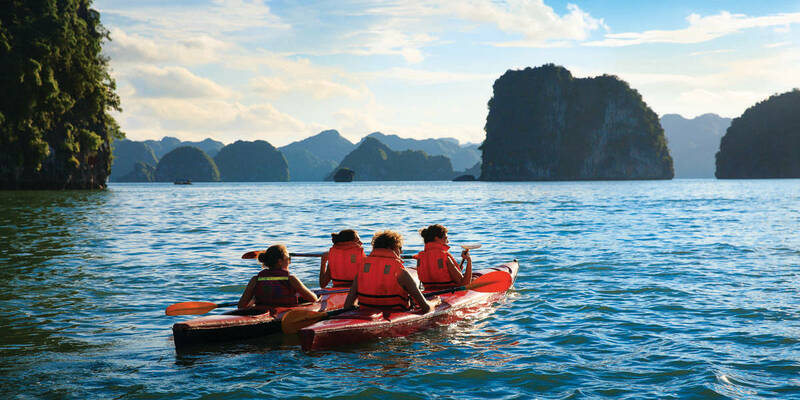 You will pass by Duck and Thumb islets, and then Coconut Island – the only soil island in the World Heritage Site. 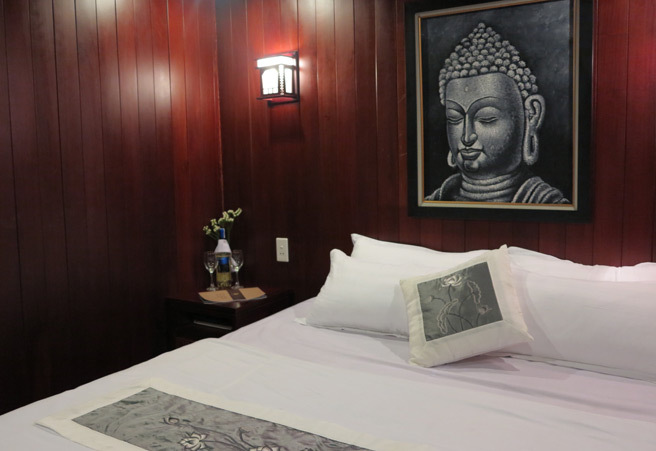 Check-in at the Golden Silk Boutique Hotel. Free time in the afternoon. 17.00. Meet the bus at Ta Van bridge to travel back to Sapa Town. Our tour guide will recommend you good local restaurants for your dinner on your own, overnight at the Sunny Mountain Hotel with night activities. You can enjoy the night market with many specialities of the highland, watch people playing their traditional flutes.